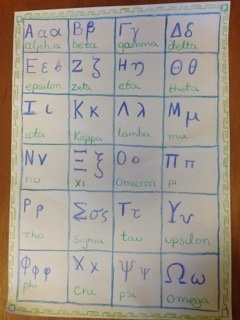 The class has written the Greek alphabeta and found all the letters that are just the same in English! This week we claped it, stomped it and wrote it in the air with our feet! We explored the many word forms in English that have come to us from Ancient Greek and discovered that “We speak Greek We just didn’t know it”!